A. 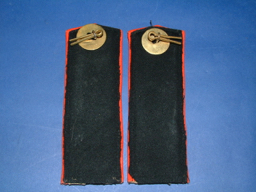 25 PAIR OF 1st GREN REGIMENT LIEUTENANTS SHOULDER STRAPS. 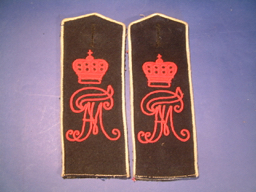 Pair of NCO's or OR'S shoulder straps of the 181st Infantry Regiment . 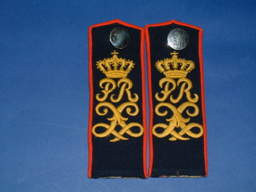 Dark blue straps with red edge piping, with stitched type yellow numerals 181 Dark blue undersides, these are the type that are sewn in and directly to the shoulders of the tunic. Reasonable quality possibly privately purchased for a Parade / walking out uniform. Good originals. 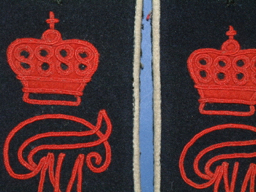 Excellent pair of NCO's or OR'S shoulder straps of the 95th Thuringen Infantry Regiment . Scarlet straps with finely woven Yellow crown and entwined letters. Dark blue undersides. Superb quality probably privately purchased for the walking out uniform. Excellent originals. 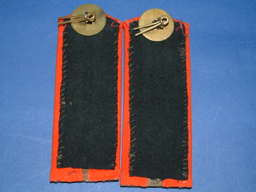 Excellent pair of NCO's or OR'S great coat shoulder straps of the 80 th Grenadier Regiment . Dark blue straps with dark red embroidered Crown and entwined letters and white edge piping Dark blue undersides. Superb quality probably privately purchased for the walking out uniform. Excellent originals and anything from this regiment is extremely rare . 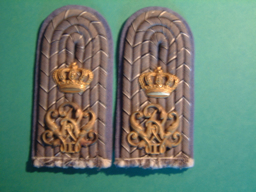 A superb pair or OR'S shoulder straps of the Bavarian 1st artillery Regiment . 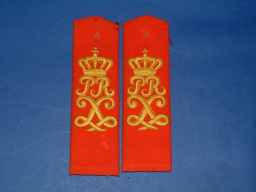 These are slightly narrower (35 mm) than those below ( 45mm ) Scarlet straps with extremely finely woven Yellow crown and entwined letters and regimental insignia. red undersides with no backing. Extremely high quality embroidery probably privately purchased for the walking out uniform. 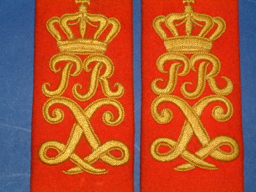 These are the type that are sewn directly to the uniform shoulders. Originals of superior quality. 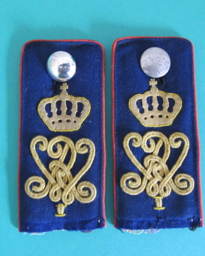 Another superb pair of One Year Volunteers or OR'S shoulder straps of the Bavarian 1st artillery Regiment . 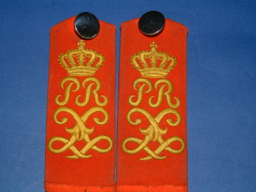 This shoulder strap is WIDER (45mm) than those above ( 36mm ) Scarlet straps with very finely woven Yellow crown and entwined letters and regimental insignia. red undersides with dark blue undersides. 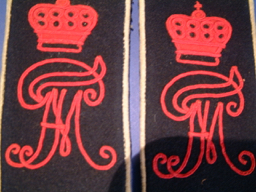 Extremely high quality embroidery, privately purchased type for the walking out uniform. 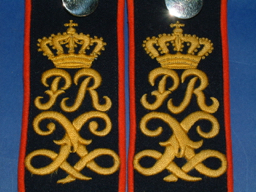 These are the type that are sewn directly to the uniform shoulders The buttons are silver I cannot understand why they appear black. These straps are a different pair to the shoulder straps shown in A.29 These straps are Originals of very superior embroidered quality. 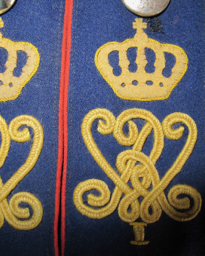 Superb pair of OR'S shoulder straps of the Bavarian 1st artillery Regiment for the Great Coat, Dark blue straps with very finely woven Yellow crown and' P R' with entwined letters of regimental insignia. Dark blue undersides. 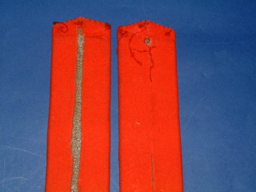 Bright red piping to the edges of the strap. Extremely high quality embroidery probably privately purchased for the walking out over coat. Originals of very superior quality. 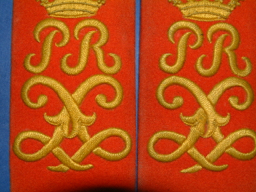 Superb pair of OR'S shoulder straps of the Saxon 101 Grenadier Regiment . 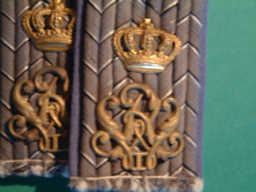 Saxon blue straps with stitched on Yellow crown and entwined W and R letters and saxon crown insignia. 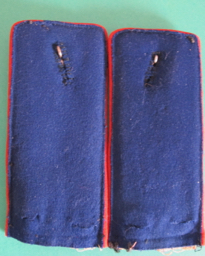 Saxon blue undersides and red piping. These are the sew on types complete with two silver buttons, one to each strap. Overall very good construction Together with their internal stiffeners Good originals of very satisfying quality.